As an optics manufacturer, Industrial Optics strives to perform 100% inspection on all of the precision grade optics that we produce using MIL-PRF-13830B specifications or by using a high intensity light for laser optics. By using a variety of interferometers, auto collimators, spherometers and other mechanical inspection equipment we are able to ensure we meet or exceed the expectations of our customers. For Radii, Industrial Optics uses master test plates made by using a Strausbaugh Digital Spherometer. For Plano work, Industrial Optics can certify flatness up to 1/20 λ using a Zygo GPI Interferometer with a 4″ aperture. 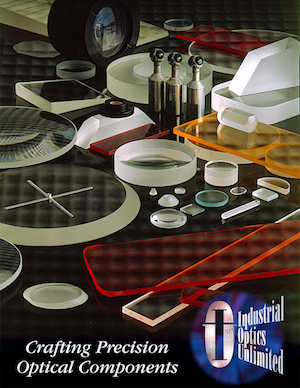 Industrial Optics offers the following processes: grinding and lapping, beveling, edging, generating, core drilling, shaping, slicing and pitch & pad polishing of most optical materials. Our normal precision grade optics standard for tolerance is +/- .127 mm (.005″) on diameters and +/- .254 mm (.010″) on thickness; however, we can hold much tighter tolerances depending on the customers’ requirements. We can fabricate optics ranging in size from 3 mm (.118”) in diameter up to 508.0 (20.000”) in diameter. Our fabrication department is equipped to handle small /prototype runs to production quantities. Whatever your requirements are, Industrial Optics will strive to meet or exceed your requirements. Industrial Optics is an environmentally friendly optical manufacturing company that produces high quality and fabricates competitively priced optical lenses, mirrors, diffusers, windows, prisms and filter glass.